It's time for our first of two "Captive Illusions" Giveaways this month! 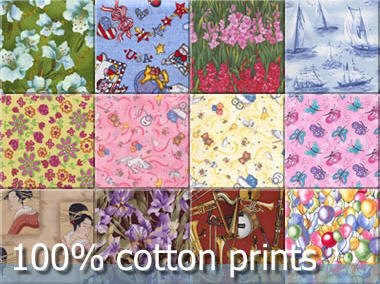 Whether you are an old pro or just starting out as a quilter, Captive Illusions has all you need to get started on your next project . 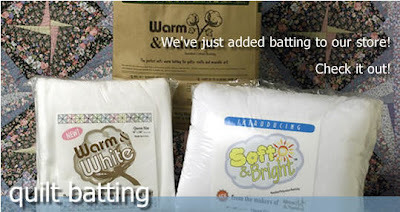 . . a large variety of fat quarters, flannel and cotton print fabrics, and high quality batting. 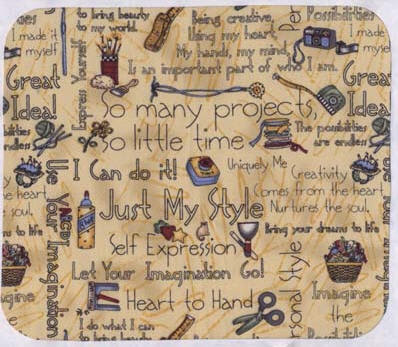 The prize for this contest is the wonderfully Crafty Mousepad shown below. This mousepad is 9-1/4" x 7-3/4" and 1/4" thick . . . perfect for the crafty blogger. This giveaway is open to worldwide entries. You do not need to be a blogger to enter, but you must have a valid email address. If you enter anonymously and do not include a valid email address in your comment entries, I will not be able to notify you should you win this random drawing. You MUST do #1 to be eligible to win the prize. After that, #2 & #3 are optional ways to gain an extra entries. Please leave a separate comment for each entry. Each person can earn up to 3 entries. 1) Head over to Captive Illusions and take a look around. Then leave a comment on this post telling me the name of which one particular fabric would you love to use in your next quilting, crafting, or sewing project? 2) For an extra entry, leave a separate comment telling me (other than the Crafty Mousepad) the name of at least one mousepad out of the 108 available that catches your eye? 3) Subscribe to this blog's feed. Then leave a separate comment telling me that you did so for another extra entry. This contest will be closed on Wednesday, November 19th, 2008 at 11:59pm EST. A random number drawing will be held shortly after. The winner will be announced here and will be contact via email or through their blog. If the winner does not respond within 48 hours, a new number will be drawn.